This baked cheese dip is the perfect blend of the simple margarita pizza and humble hummus. If you have never tried baking hummus before than I certainly recommend it, it is far better served warm with a good glug of olive oil or melted butter. Across the Middle East hummus is often eaten hot, or at room temperature, never cold from the fridge which robs it of its flavour and texture. If you do not make your own hummus then warming up ready made from the supermarket makes it immeasurably better. From warm baked hummus slathered in oil or butter it seemed logical to top with some salsa and shredded mozzarella & cheddar to make a cheesy margarita pizza hummus. appetizer and pizza in one easy to make bowl. No need to call for a take out, considerably cheaper and, if these things concern you, gluten free, low carb and packed with protein. You have to be able to claim some health benefits these days to offset the cheese, right? To make things super simple and fuss-free I have cheated and used a pot of supermarket hummus and ready made salsa or pizza topping, or course you can make your own, but speed and immediate gratification are of the essence here! Simple layer the ingredients into an oven proof dish, bake until the cheese is bubbling and BAM! 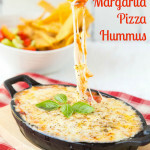 Cheesy Margarita Pizza Hummus! 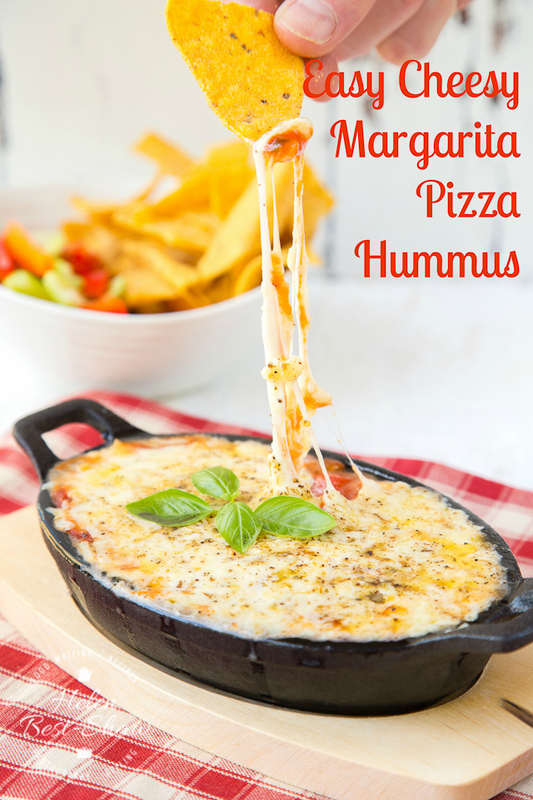 If you try this Recipe: Easy Cheesy Margarita Pizza Hummus please tag #FussFreeFlavours on Instagram or Twitter. It is amazing for me when for me when you make one of my recipes and I really do love to see them. You can also share it on my Facebook page. Please pin this recipe to Pinterest too! Thanks for reading Fuss Free Flavours! An easy vegetarian 4 ingredient recipe for baked hummus covered in pizza sauce and lots of melted cheese. Dip meets pizza is so delicious! Spread the hummus into an oven proof dish, top with the salsa, then the cheese. Bake at 180C/ 350F until the cheese has belted and starting to brown. Enjoy with tortilla chips and veggie sticks.